I noticed people have been searching the site for Christmas in July ideas and toilet paper roll projects. Well, my aim is to please, as my grandmother always liked to say. ...unlike me last year when I decided our tree needed a new star on the evening of the 23rd. Last minute Christmas crafting? Bring it on! 4 tp rolls or enough to provide a total of 30 half inch segments. For example, the ones I used measured 4 inches long so each roll provided eight segments. 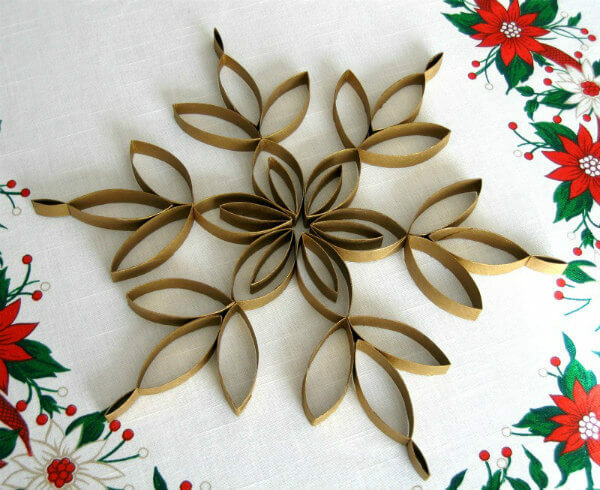 Additional quilling and paper craft supplies I recommend can be found in my Amazon shop. Step 1: Flatten each tp roll and mark off 1/2 inch segments along both sides of its length. Cut across the roll using the marks as guidelines to make 30 pointed oval (marquise) segments. Step 2: Cut 6 of the segments into two unequal pieces so that the smaller section measures about 3/4 inch in length and the larger one about 1 1/2 inches. 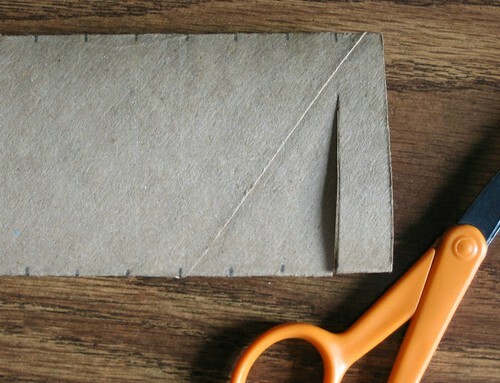 Each segment will have one folded end and one cut (open) end. This is getting a little confusing... let's recap! Step 3: Brush or spray one or two coats of gold paint on all of the surfaces, inside and outside. 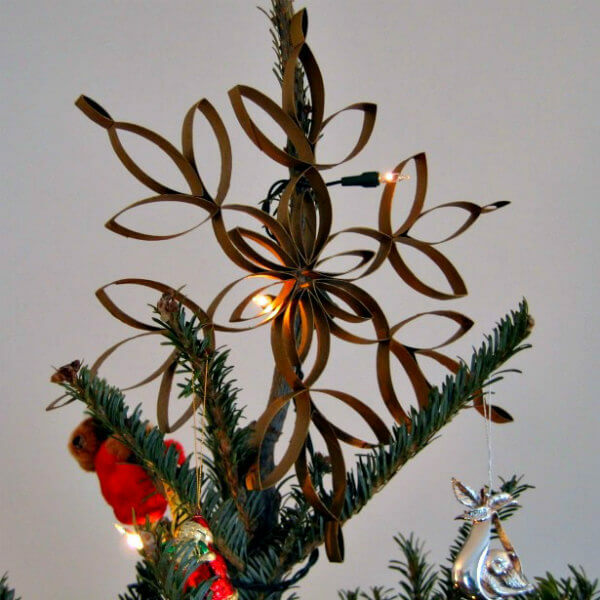 Step 4: To assemble the innermost section of the tree topper that looks like a flower with six small petals inside six larger petals, glue the open end of a medium loop inside one end of a large loop. It's easiest to do this on a non-stick surface. Hold the loops in place with straight pins while the glue dries. When dry, assemble the "flower" and set it aside. 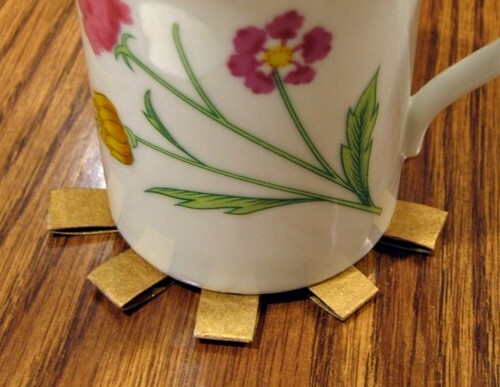 Step 5: Glue the open ends of the smallest segments and place them under a mug to weigh them down while the glue dries. Trust me, there are six. The last one is hiding on the other side of the mug. 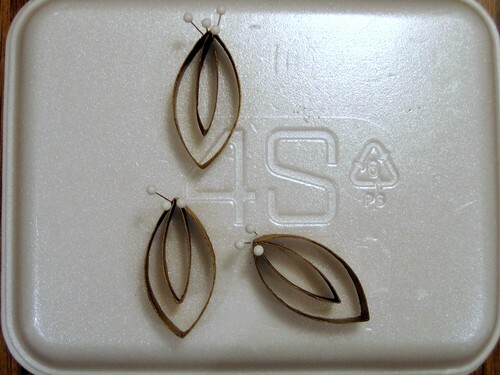 Step 6: While these small segments are drying, arrange and glue six 3 petal arrangements that will form the outermost ring. Again, work with pins on a non-stick surface and allow the glue to dry. All this glue-waiting is important so the snowflake/star winds up with symmetrical diagonals. Make Mother Nature proud. Step 7: Glue a three section segment to each of the central petal tips and then glue one of the smallest sections to each of the outermost ring sections. Step 8: Touch up any missed spots with paint. It's so enjoyable to make something out of practically nothing. And now I challenge you to say TP Tree Topper three times fast. Looks so good!! With the gold painting it looks so very brilliant. I am sure it is sturdy because of the thickness of the roll. Wonderful idea for recycling. No one will have any idea of the source. 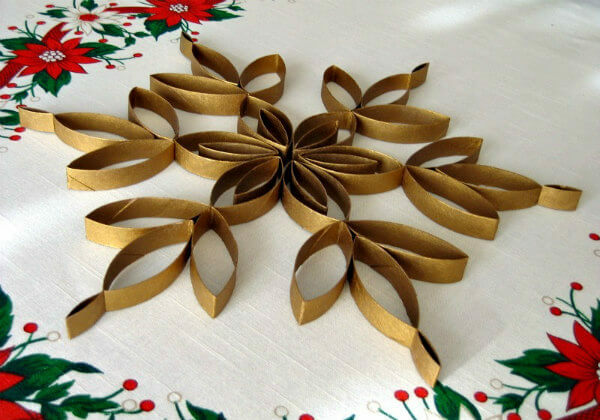 It looks great and it's never to early to get a start on that Christmas crafting. I've seen so many great projects made from the toilet paper rolls. ha, if you didn't mention it, i hardly think it's made of TP rolls! Thanks, Ann, excellently written and illustrated! Lovely!!! Touch of gold adds much more nicer look! So inspiring Ann - love it! Thanks for the nice comments everyone; I'm glad you liked it! What an awesome idea! I may be making a few of these. Thank you for sharing your wonderful ideas! Oh that's great... I hope you will make some! Love these! Just finshed making 2 and they look exactly like your pictures. Thanks so much for including the measurements, they were so easy to make with your detailed instructions!! I'm very glad to hear that, Nicole - enjoy! I know this post is over a year old but I just made this and it looks awesome!!! Thank you so much for sharing! I painted shimmery silver to fit our tree but other than that, followed everything :) I recommend the hot glue. I tried regular glue and krazy glue too but the hot glue just worked a lot better for me. Thanks for your comment, Kathy - I'm glad you made the snowflake! I can see where hot glue would get the job done more quickly. ann...a very informative tutorial....the star/snowflake looks very classy on top of your tree. I'm not much for DIY projects, but this is something I think I can do! So inexpensive, so easy, yet so tastefully decorative. I like the center by itself (sans the extra points that make the outermost ring)and it can serve as an ornament. Good idea! Have fun making ornaments. Nice ideas! I'm glad you like the pattern. This is one project with toilet paper that I LOVE! I am going to make this very soon! OK, Now for a Easter Tree topper you could paint them pastel colors, even several pastel colors .. like yellow , pink, lavender, lt. blue or turquoise ????????? Good idea! Maybe just the center section as it looks like a flower. This is going to be a fun project. I'm going to spray mine white and put glitter on the to hang in my windows as snow flakes. Thanks for the great idea. You're welcome! Glittered snowflakes will be pretty.